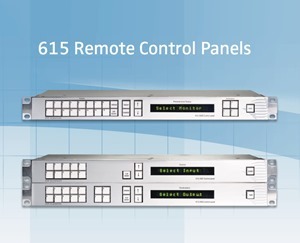 The NTP 615 remote control panels comprise of two different 19” panels; a 2RU source/destination panel and a 1RU monitor panel. The control panels interface via TCP/IP to the NTP RCCore control system for control of the NTP 625 and Penta 725 cross point connections. The Source/destination panel consist of two physical panels. One panel where the destination is selected, and one panel where the source is selected. Each panel is connected to a mains power supply and an Ethernet network. The destination and source channels can be selected from a list of outputs and inputs, which is defined and setup in the control system. The channel names are shown in the 16 digit alpha numeric LED display on the front panels. By using the arrow keys it is possible to scroll up and down in the destination and source lists. Each output and input can be associated with a 3 digit short cut number, which can also be setup in the control system. By selecting a shot cut number on the keypad, the name of the output and inputs channels are shown in the display. A connection in the router system is made by activating the TAKE button. The monitor panel can control the monitor sources of 1 to 4 different outputs. For each output the group and the source can be selected from the cannel lists, which is set-up in the control system. The list can be scrolled using the arrow keys The name of the channel being monitored is shown in the 16 digit alpha numeric LED display on the front panel.16 presets can be assigned for each output for easy selection of the signal monitored in the system. If only one monitor output is configured 64 presets are available.